metier at a young age. 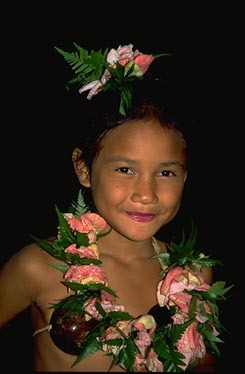 The little girls wiggled in their grass skirts as the vahines pinned floral crowns on their indigo hair and cupped pearly shells on their chests. Their costumes done, one by one, they began practicing the tamure, a hip-thrashing dance that quickened to a wild tempo. When the drummers, guitarists and flutists (the last of whom, by the way, played their instruments with their noses) shifted to a melody, the girls switched modes, and began dancing the slow-moving hura. Their eyes twinkled brightly. They knew that long hours of practice meant they were able to perform this beguiling, hip-sashaying dance perfectly, right down to its traditional Tahitian curtsey. "La Orana, hello," I said, wiggling my finger in a come-hither motion. "May I take your picture?" After one vahine signaled approval, the girls posed, then curtsied gracefully, as if I'd honored their beauty by photographing them. No wonder Polynesian dancers have such captivating grace, I thought. They learn young. 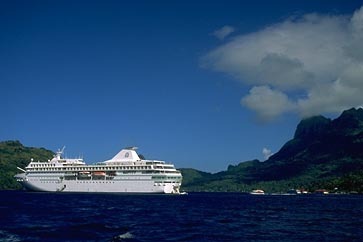 By now, while sailing on the ms Paul Gauguin, we'd discovered that French Polynesia's Society Islands, which rise like sculpted emerald peaks from crystalline lagoons, have a seductive beauty of their own. It's easy here to slip into the Tahitian mode of "haere maru", or "take it easy". Our ship - the intimate Paul Gauguin - was inspired by the Postimpressionist painter who fled France and his lucrative stockbroker career in the 1890s for a blissful life in primitive Tahiti. Crafted like a luxurious large yacht, it showcases the islands' easy nature. 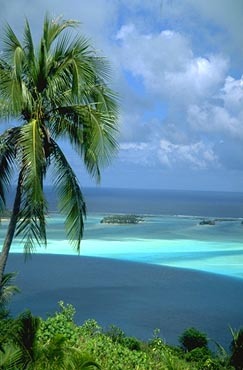 Tahiti is the largest of the 115 Society Islands which include Raiatea, Tahaa, Bora Bora, Moorea, and the coral atoll of Tetiaroa (Marlon Brando's private retreat). Their wild tropical beauty excited Robert Louis Stevenson to pen "Treasure Island" and "Kidnapped". 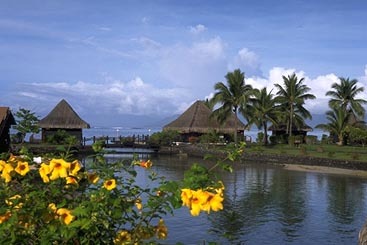 Lush Moorea inspired James Michener and the fabled Bali Hai of the musical, South Pacific. Long before the writers arrived, Tahiti's luscious fruits and beautiful women, enticed the Bounty's sailors to choose "paradise" over torment by Captain Bligh. waters of Bora Bora Lagoon. Dubbed the Island of Love, fragrant Tahiti comprises two extinct volcanic peaks perfumed by gardenias. Imagine our glee on arriving at the Beachcomber resort. Our thatched-roof hut was perched on stilts in the opalescent lagoon, steps from a sugary beach and pool facing the island of Moorea across the sea. 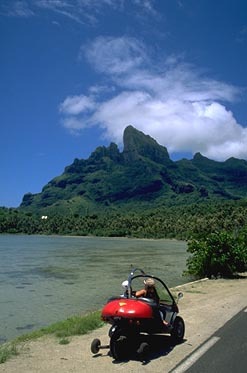 Exploring Tahiti by jeep, we found there's more to "paradise" than first greets the eye. 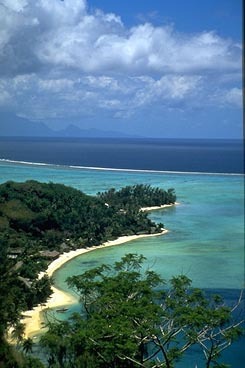 After relishing its natural beauty, marked by white-sand and black-volcanic beaches, romantic grottoes skirted by wildflowers, and dense rainforests cooled by high waterfalls, we were sobered up considerably by pockets of overwhelming poverty near Papeete harbour and in the island's interior. And for all its renown, the Paul Gauguin Museum has little artistic grace. Except for a few woodcuts and wooden utensils, it lacks the artist's original works. A collage of prints maps out where Gauguin's works exist around the globe. Another illustrates his life. Its one redeeming quality: The museum's seaside garden setting is lovely, adorned by ancient tiki gods, exquisite in their naïve simplicity, and paintings by unknown artists mimicking Gauguin's inimitable style. Tendering ashore from the Paul Gauguin to Bora Bora. When the Paul Gauguin dropped anchor in Raitea lagoon, a sailboat carried us on a snorkeling expedition to a motu, a tiny islet in the lagoon. Others participated in the ship's accredited scuba dive program, or drove with a paleontologist to marae ruins (stone structures akin to temples) where ancient Polynesian tribes celebrated mystic rituals. Early next morning, the ship's crew staged a lavish beach party on a sandy motu in Tahaa lagoon complete with Polynesian entertainers and kayaks beached on white sand. We were greeted ashore by crew, wading waist-high in water, carrying silver trays with flutes of chilled champagne. A secluded beach at Bora Bora. Two days anchored in dreamy Bora Bora lagoon were pure paradise. A jeep safari up rough mountain roads led to dazzling views of its multi-hued water. While others went deep-sea fishing, shark feeding, flight-seeing or parasailing, we scooted around Bora Bora on wave runners, stopping for a cool swim at a pristine motu. A volcanic island twice as old as Tahiti, this lush paradise of six mountains sculpted into jagged-edged profiles by wind and rain, and edged by champagne beaches, is home to California's Berkley University of Marine Studies, where a marine biologist is studying the Spinner dolphins. Though the famed acrobatic mammals eluded our sailing expedition, a marine biologist gave a fascinating explanation of their plight to survive. Then we dropped anchor and snorkeled around the brilliant coral reef. Those who ventured to protected waters to swim with dolphins or stingrays, raved about close encounters with the creatures, not to mention scratches by prickly sea urchins. 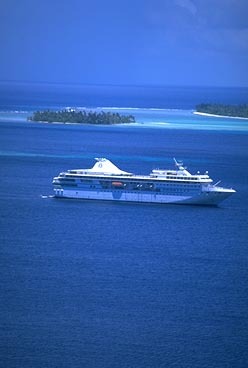 Tahiti's Haere maru - take it easy mantra - suits the ms Paul Gauguin fine. Cleverly designed for spacious illusions, the compact ship boasts vast windows that meld scenery and sunshine into a memorable Polynesian experience. The Paul Gauguin lowers its marina brimming with windsurfs, kayaks, and outriggers in the lagoon. Impressions of Gauguin adorn the vessel. In one foyer, original woodblocks and a bronze sculpture join a brightly appliqued tifaifai (traditional quilt). Stateroom hallways are graced with etchings depicting Tahiti's primitive beauty. The staterooms, half of which boast verandas, are embellished with native woods and mirrors that reflect fabrics in soft shades of sunsets and sapphire seas. If ever a ship proved that formal attire, de rigeuer on most ships, is a frivolous imposition, the Paul Gauguin does so in haute style. Jackets are never required. Meals were sumptuous events with well-matched wines, whether we dined alfresco in the Grill (the casual deck-top eatery that serves abundant breakfast and lunch buffets, and grilled fish, seafood and meats at dinner), or in the signature restaurant, L'Etoile (choosing from its classic continental menu), or in La Veranda (on a five-course Italian repast or French feast created by Chef Jean-Pierre Vigato whose famed Apicius restaurant in Paris boasts two Michelin stars). 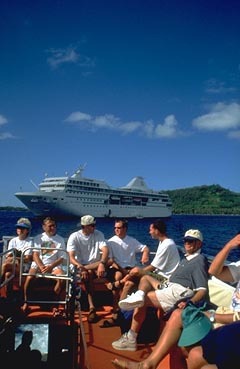 The 206-member crew and Gaugeens - the ship's Polynesian hostesses - cater to 320 guests. A roster of programs - ranging from Tahitian dancers to marine lectures - added to the excursions and program at the ship's French Carita Spa. When the Paul Gauguin dropped anchor in tranquil lagoons, it lowered a marina brimming with windsurfs, kayaks, and outriggers. Blissfully, we whiled away our last afternoon, kayaking in a lagoon cloistered by the jagged peaks of Moorea's chiseled silhouette, paddling ashore only to see Polynesian dancers practice their metier at the waters edge.